The basic version is a lighter blue, and the Pro is a darker silver-blue. The basic model has a black base with six rubber feet to prevent it from slipping on the floor. The Pro version’s gray base is smooth but made from a non-skid material that won’t mark your floor. Both devices are 25 to 26 inches in diameter, depending on the model year — the 2013 versions are 26 inches — and 12 inches high when the domes are fully inflated. 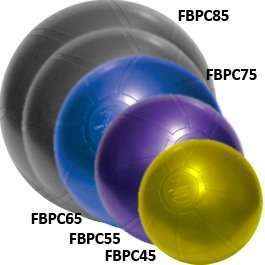 Both versions feature a weight limit of 300 pounds.Professional grade BOSU Balance Trainers! Extremely durable for use in facilities or personal training. Supports up to 300 lbs. Commercial warranty on defects. Includes air pump and exercise manual. Dark blue with black base. 25″ diam. 15 lbsCurrently used in health, fitness, sports conditioning and rehabilitation facilities, and known industry-wide for training balance, building strength, fine tuning skills for sport, enhancing flexibility, and delivering killer cardio workouts, the BOSU® Pro Balance Trainer challenges the entire body with integrated, multi-joint movement that requires muscle groups to work together. 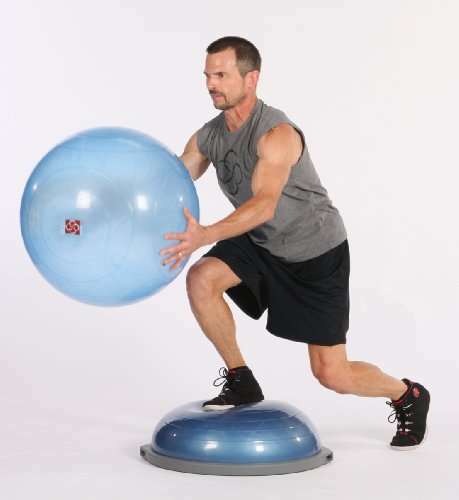 Use the BOSU® Pro Balance Trainer dome or platform side down, combine it with other equipment, or use it as a stand-alone product to make any exercise fun, challenging, and effective. If you need your Bosu Pro Balance Trainer for heavy use, then this is the commercial version made for your purposes. 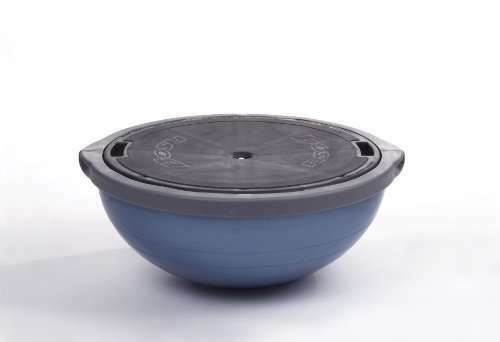 As a personal trainer and weight loss camp operator, each Bosu balance trainer needs to hold up under heavy daily outdoor use. 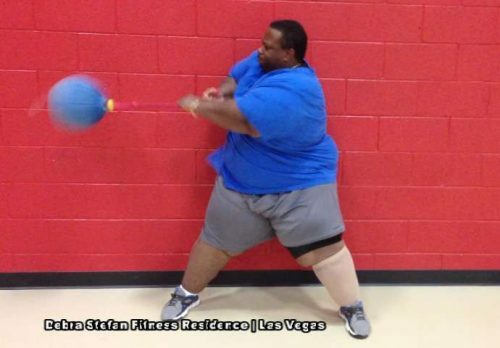 Frequently, my clients are between 300-500 lbs and all 7 of my my commercial Bosus have held up for 7 years and counting. 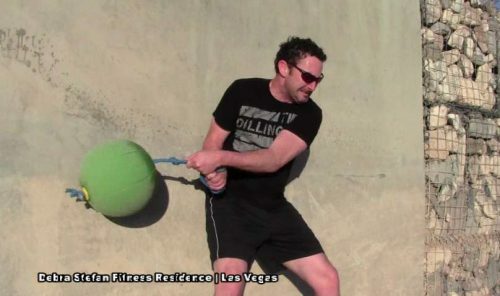 Although it is not advised to allow your inflatable fitness equipment to be exposed to extreme temperatures, I have used mine outdoors daily in the Nevada sun. 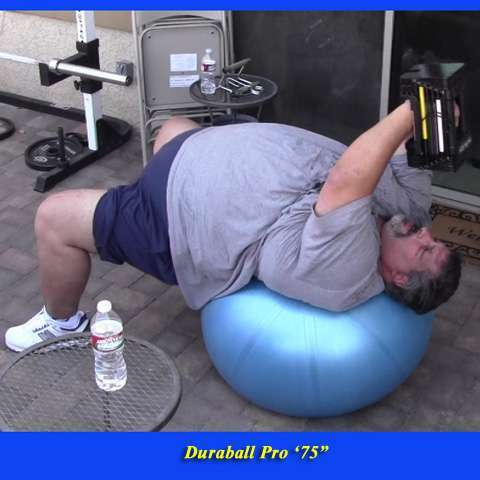 Although Bosu specifies a weight limit of 300 pounds, I have found that to be far too conservative for my use. 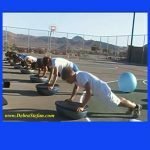 You will see photos of two of my 500 Lb weight loss camp men using the Bosu Pro Balance Trainer for stability and core work. At my fitness residence the very first client training orientation includes the Bosu. 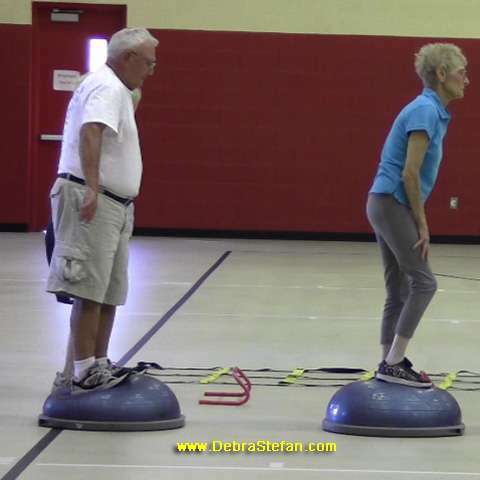 Whether senior fall prevention or student athlete sports training, the Bosu comes out to play every time we set up a workout. 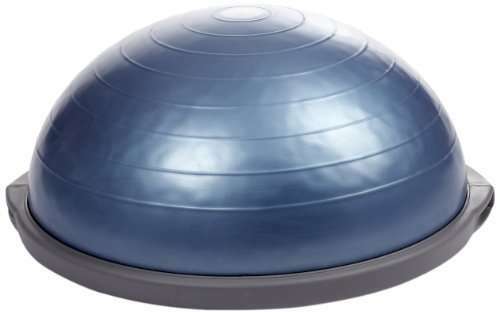 Place the Bosu Balance Trainer with the flat side up. Position the Balance Trainer in the middle of an interior doorway on an even surface. Hold onto both sides of the doorway while placing a firm footing with the right foot positioned at the 3 o’clock position. Push the Bosu all the way down to the edge. While holding onto both sides of the doorway, step the left foot into place on the 9 o’clock position. 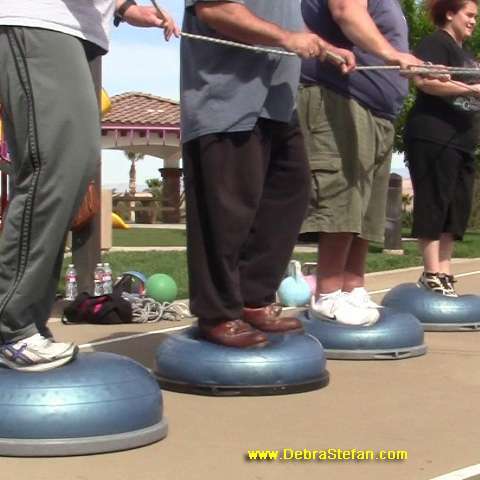 With weight even on both feet try to maintain the Bosu at a level position. The first time you do this, there will be a lot of shaking for about one minute followed by a new found steadiness. The nervous system gets excited learning a new brain-to-body motor pathway, but quickly learns where to find neutral. If you feel burning in the feet or calves, be sure to dismount early. 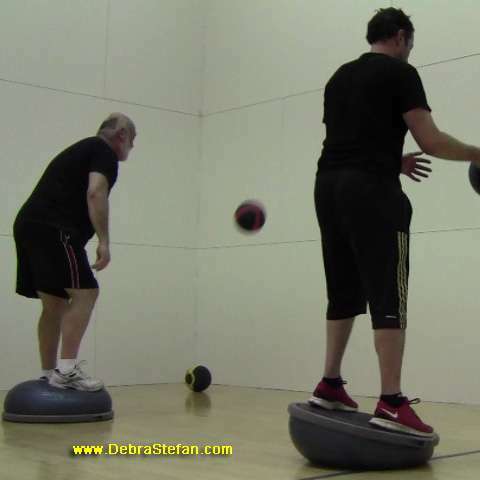 Dismounting the Bosu from the flat side is the same in reverse as the mounting. Progressions begin by striving for 1-2 minute holds in order to activate the small stabilizers in the lower extremities through the calves and feet. This adaptation will not take long to work toward more dynamic movements.